I have been working for several weeks on my latest quilting design. That appears to be my quilting motto. I outlined the faux Hawaiian applique blocks with off-center circles. Then I got stuck for a few days figuring out what to do next! A little ruler work around the triangles is a good time to clear the mind. Straight lines help curves pop...I think. Then I was just down to figuring our how to fill in the background. pops on a fabric with a busy look but that's what I did! 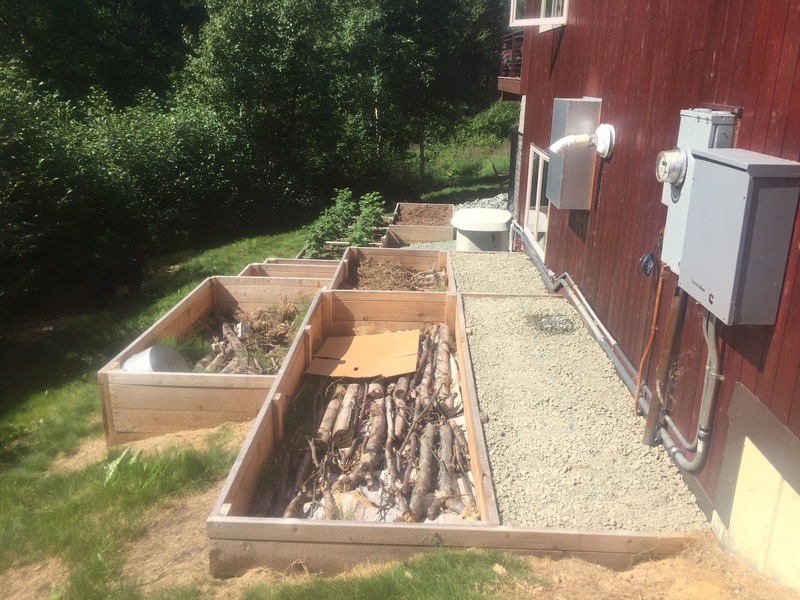 Below is what my garden beds looked like halfway through the summer. I am trying out the German method of Hugelkulter. starting with large pieces like logs and layering with smaller pieces like twigs and leaves. A quilting friend did her garden beds like this several years ago and it is a great success. By the end of the fall I was ready to add soil. Major dilemma about how to get it around the side of the house that is on a little hill. No way was I trying to fill these raised boxes with a wheel barrow and a million trips. So we bought a pallet of bagged garden soil from Lowe's and filled them in that way. and drive it from our driveway to the garden boxes. Once filled, I covered them with black plastic sheeting to kill any weed seed in my organic matter. That worked so well...I convinced my husband to get two more pallets of garden soil for the perennial bed I outlined with rock last fall. Below is delivery day for the bags the first week of April. gave us an ice slide to drop the bags from the bed of the pickup. As I recall, there were 48 bags on each pallet. and we are almost done with our snow. It is all rather mushy and muddy right now. That part is really not fun with dogs! I am so excited to have the major obstacle of soil positioned in my beds already. so I didn't open them up yet. I need to figure out a way to keep the dogs out of the perennial bed before I open up all that dirt! I finished a set of felt Christmas ornaments. Some are so ugly...they are cute. Like the Meowy Christmas sweater. Those bare root perennials I bought from Costco are growing. The two freezers we have in our garage appear to be a great area to start plants. Three bleeding heart plants are looking fabulous. This plant loves Alaska! I have several Astilbe sharing some of these yogurt containers. Going to need to transplant them to their own containers very soon. Seeing new green life is always very exciting to me. I almost shared a photo of every container. Very anxious for the growing season.